I’ve been cleaning for as long as I can remember, but apparently I’ve been doing a lot of things wrong! Or, the hard way, I should say. And it’s not always necessary to buy the expensive bottled stuff to get your home clean, not when things like baking soda, peroxide and vinegar actually do a better job. Although, I can’t seem to break my habit of the Mr. Clean Gain scented cleaner. Who can resist the smell of fresh laundry in every room? Spring is right around the corner, and I figure it’s as good of a time as any to get started with the annual deep cleaning. Things like my lent traps, ceiling fans, and other places in the home that get forgotten about. I like to break it up so I don’t get overwhelmed – tackle just a few things a week. 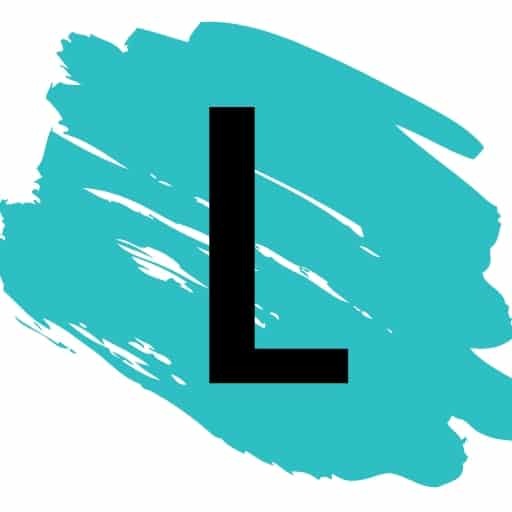 I’ve compiled a list of household cleaning tips and tricks from around the web that I really found useful! Some of these are just plain genius. I kind of get grossed out by sponges. Do you? I just feel like they are perfect for harboring millions of germs. I do like the sponges with the rough side for scrubbing out hard-to-clean pots and pans, but end up throwing them out before their life cycle is over. What a waste! 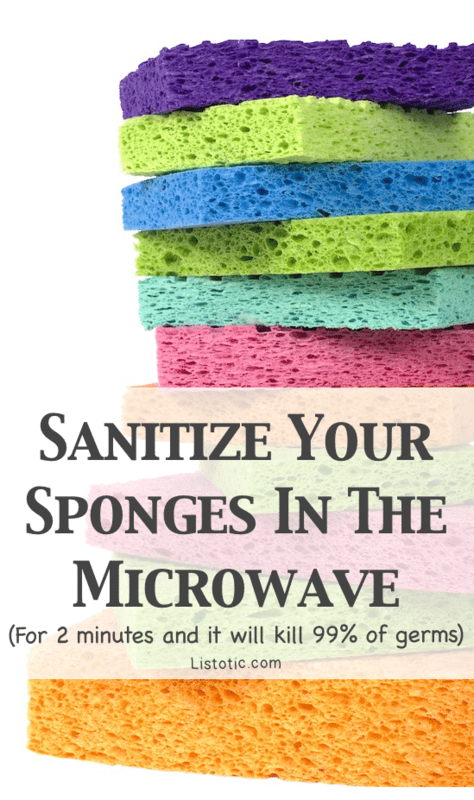 Instead, put them in the microwave for a couple of minutes and watch as the microbes sizzle away. 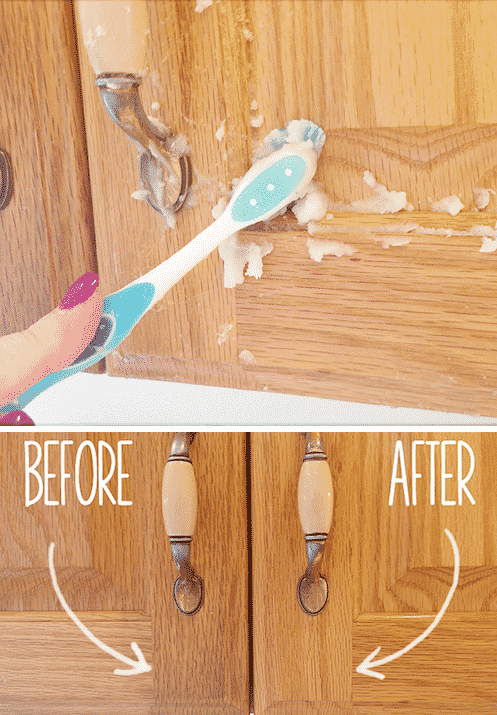 Have you taken a close look at your cabinet doors lately, especially around the handles? You’d be surprised at how much gunk can accumulate over time. To be honest, I’m not sure that I’ve ever given my cabinet doors a good scrub. Yikes! This cabinet cleaner only requires 2 ingredients, and you probably already have them right in the cabinet that needs to be cleaned. 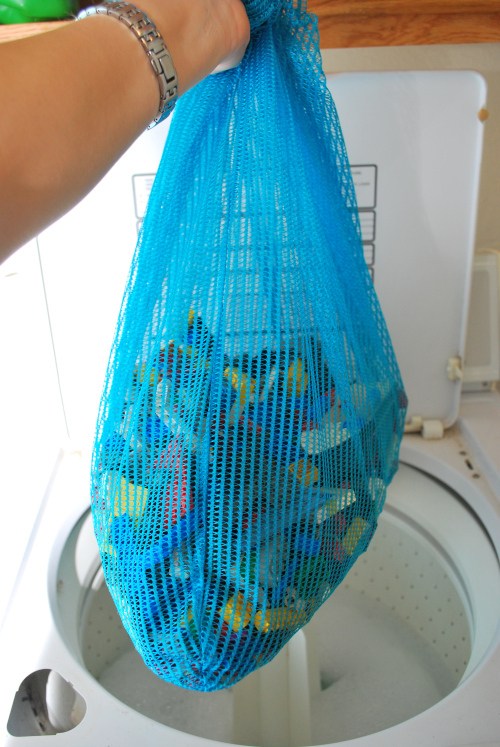 I’ve never thought to wash anything in my washing machine other than clothes, but I suppose a laundry bag can make it possible to clean so much more, including small lego pieces! You could also use this concept in the dishwasher.